Birdie’s owner called our hospital right away to get the bump checked out. She said it was so small it was probably nothing, but she just wanted to be sure in case it needed to be removed. During Birdie’s exam, a small sample was collected from the mass and sent away for analysis. To everybody’s surprise, when the results came back it was revealed that the small growth was a mast cell tumor which can become aggressive malignant type tumor. Birdie was scheduled for sugrical removal right away. Thankfully, because Birdie’s family brought her in so early, the entire mass was able to be removed very quickly while it was still very small. Final analysis (Full biopsy) report showed that her prognosis is good because it was so small and treated so early. 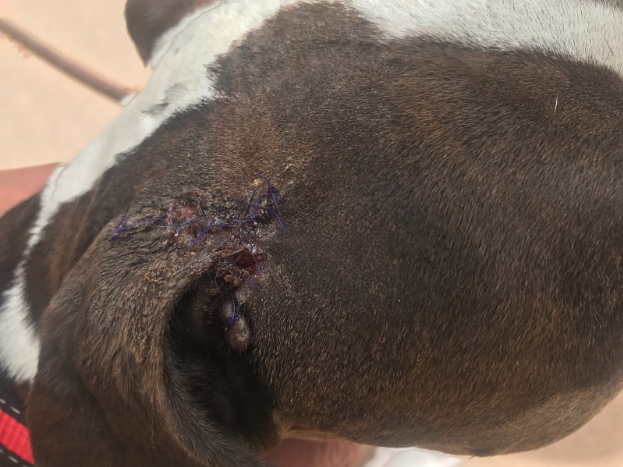 Birdie’s case shows how important it is to monitor your pet for any small changes, and if you see anything abnormal to get it checked by a veterinarian right away. Thanks to Birdie’s family noticing a very small change and getting it checked, Birdie will have a much more comfortable life! please call our office at (480)895-3223 to schedule a consultation.